I didn’t post a bake along last week as I’ve been on holiday, I feel like I lucked out as Tudor Week looked tough! This week I’ve made some pretty Apple Pie Fondant Fancies. I’m still not over Benjamina’s shock exit either… This week was patisserie week and also the semi finals! As usual Bake Off is coming to an end far too fast. 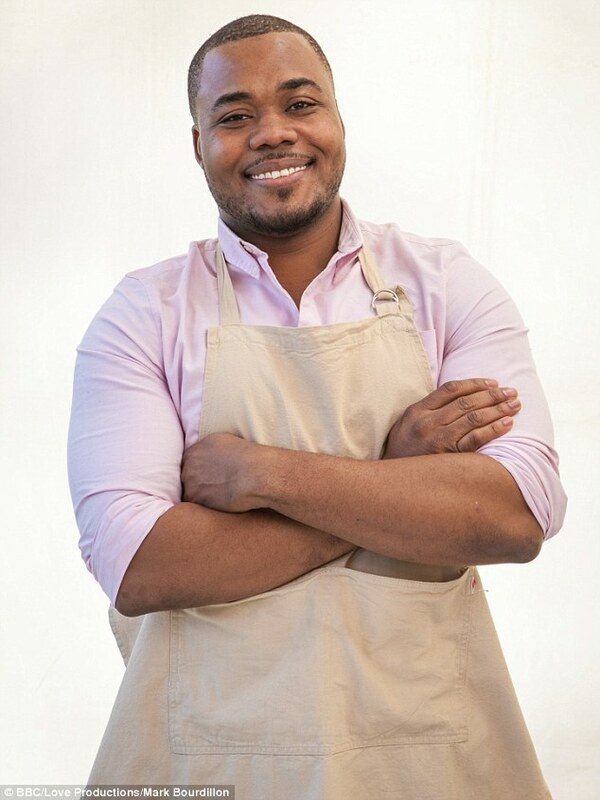 All of the bakers were very nervous this week, even Selasi! Jump straight to the Apple Pie Fondant Fancies recipe! 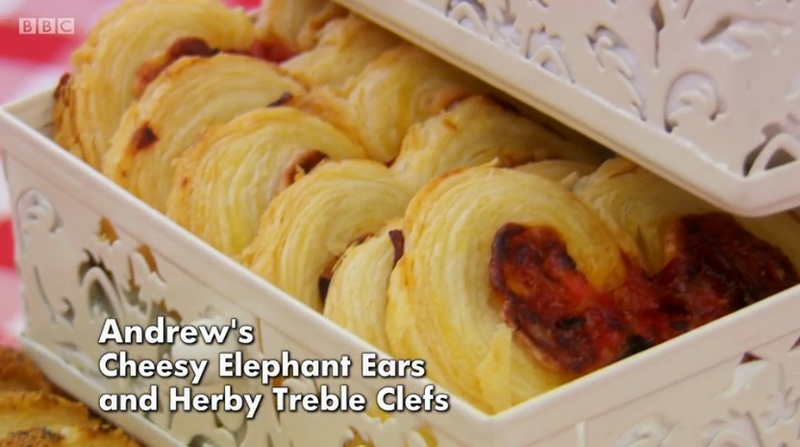 The signature challenge was to make two styles of 24 savoury palmiers, using only puff pastry (no rough puff allowed!) Paul and Mary were looking for layers in the pastry, and a small amount of filling but with a lot of flavour. 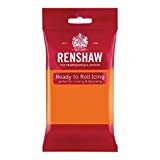 There were some debate amongst the bakers over whether they were using strong bread flour or plain flour for the puff pastry dough, with most of them using a mixture of the two. Andrew was the only one who used only plain flour and he had to re-start his puff pastry as it was too crumbly. There were lots of different palmier shapes from the bakers. Jane made flowers, Andrew did musical notes, Selasi made butterflies and Candice made hearts. 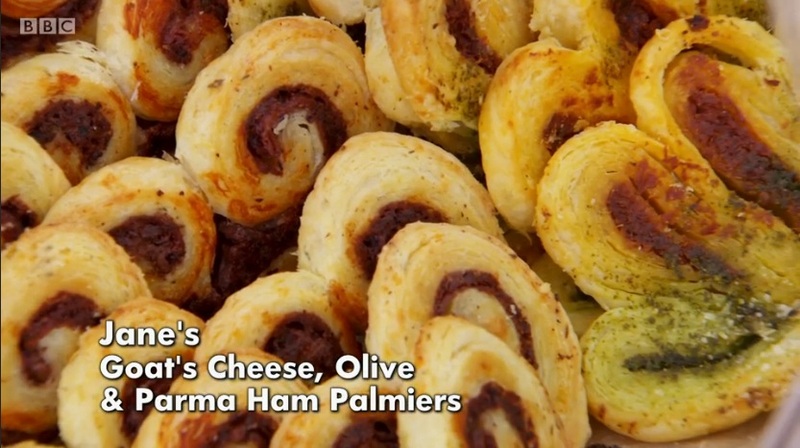 The judges thought Jane’s pesto and sundried tomato palmiers were not fully baked, they loved the flavour of her tapanade palmiers but again they were not quite baked. Candice’s pastry was well baked and the judges enjoyed the flavours, however they felt the palmiers were too big and thick. Selasi’s palmiers were also underbaked. Despite Andrew having to redo his pastry, his palmiers were crispy and Paul loved them. 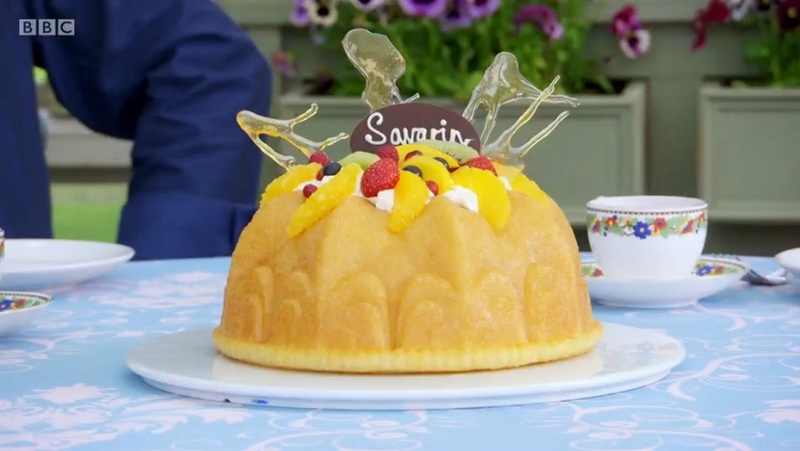 This week’s technical challenge was to make a Savarin, this is basically a large rum baba. It’s a yeasted cake which is soaked in an orange liquor syrup and decorated with whipped cream and fresh fruit. Paul warned the bakers may not prove the cake correctly, and he also wanted to see the cake evenly soaked with the liquor. Jane knew what it was, but the others were unsure. 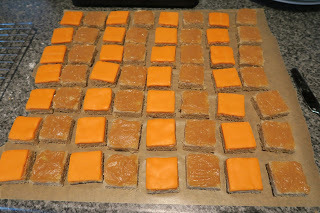 Jane struggled with the caramel shards, I lost count of how many times she attempted to make them! All of the bakers had very neat piping skills when they made the chocolate label for the cake. It was a hot day in the tent so they all struggled with getting the cake to cool so they could add the whipped cream decoration. Paul actually gave the bakers some grace for this! 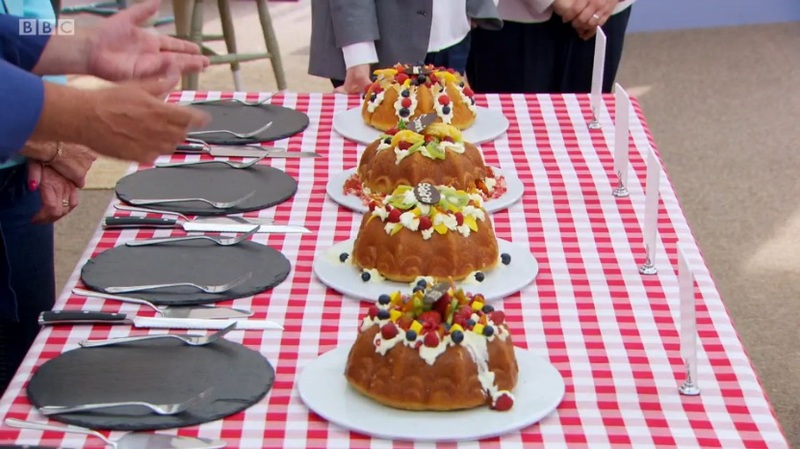 Selasi came last as his savarin was over baked and his orange segments still had membrane on, Candice’s was also over baked and under proved which meant she got third place. Andrew’s was also slightly over baked so he came second, and Jane won despite not being successful with the caramel decoration. The showstopper was to make 36 fondant fancies, two different types, all made with genoise sponge, and all made from scratch. They had 4 and a half hours to complete the challenge, Mary admitted that you’d make the sponge the day before usually which would make it more difficult for the bakers, but of course she still wanted them to be perfect. Paul wanted to see shop standard fancies with flat sides. 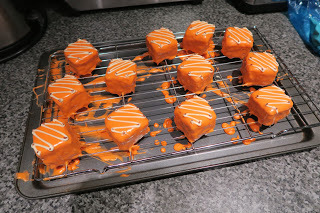 I liked Jane’s tip to use a potato masher to dip the fancies into the fondant. Mary made a comment about Selasi not sifting his flour, so he immediately re-made his sponge again! 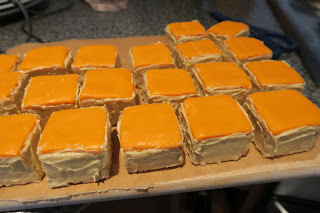 All of the fancies had to be covered in buttercream to ensure smooth sides, but Jane was the only baker who decided against doing this as it is a time consuming element to the bake. It was a very tense time in the tent as they all struggled to complete the challenge on time. Mary and Paul both loved Candice’s praline fancies and cherry bakewell fancies, they thought the overall apperance was a bit messy but the flavours and fillings were what won them over. 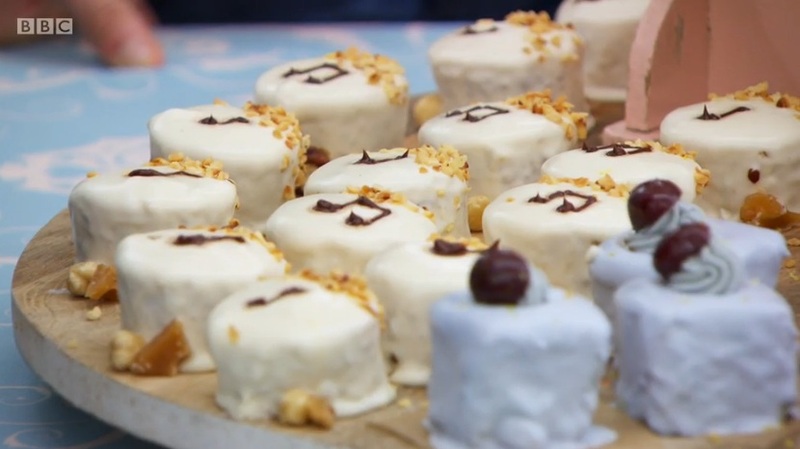 As Jane did not use buttercream to cover her fancies, the side were very messy and the judges noticed this immediately. 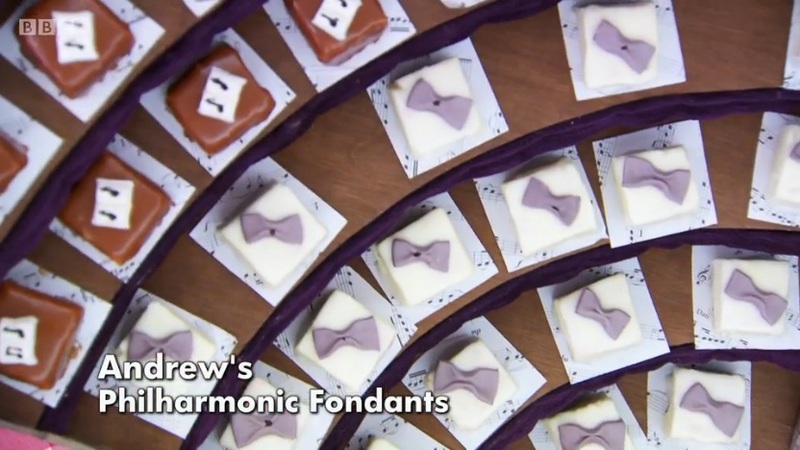 Andrew’s fancies looked fantastic, I loved the way he presented them, it was such a clever idea.The judges agreed and called the presentation ‘stunning’. 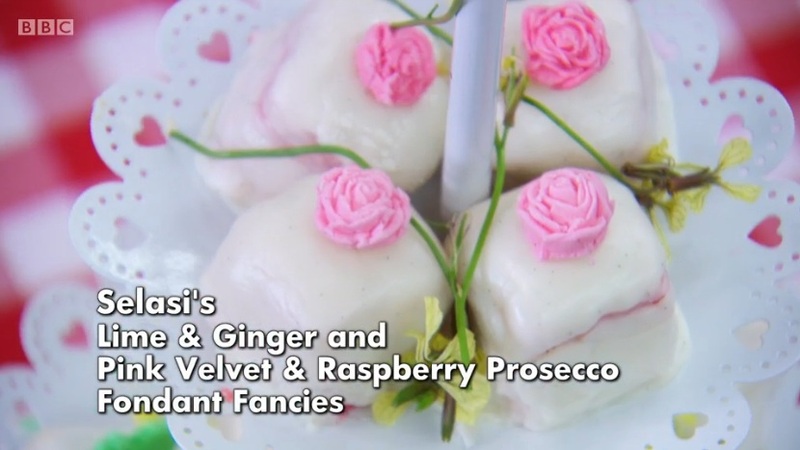 Selasi left this week, he came last in the technical and the judges thought his white chocolate fancies were overly sweet. It was very close between him and Jane I thought, and I was surprised they chose him. Next week is the final and we get to find out who the winner is! 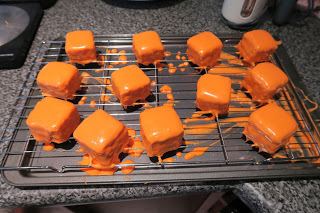 This week I decided to make Apple Pie Fondant Fancies. I find making puff pastry from scratch quite boring (too much turning and folding) and I don’t have the right tin to make a Savarin. Making these Apple Pie Fondant Fancies gave me so much sympathy towards the GBBO bakers! They are very time consuming due to all the different stages, but ultimately worth giving a go at least once as they taste so good and look really impressive! 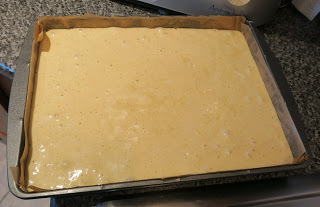 I started by making a genoise sponge and whisked up eggs with golden caster sugar for about 7 minutes until it was thick and had reached the ribbon stage. Then I sieved in a mixture of plain flour and cinnamon in three stages, and gently folded them in each time. 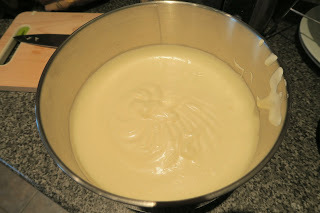 Next I added melted butter which I poured around the edge of the bowl and folded in. I poured it into a lined baking tin. It baked on 180C/160C fan/Gas 4 for 25 minutes. I let it cool then wrapped it up and put it in the freezer for an hour. While the cake was baking I made the apple filling. I heated up cooking apple, cinnamon and light brown sugar on a low heat for 15 minutes until the apples were soft. 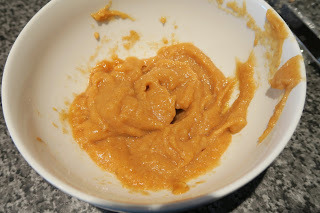 I let the mixture cool, then whizzed it into a puree using a hand blender. 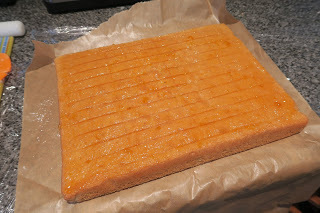 Then I took the cake out of the freezer and brushed a thin layer of apricot jam over the top. 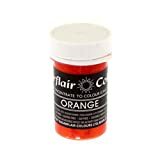 I rolled out a 250g pack of orange fondant and covered the cake with it. 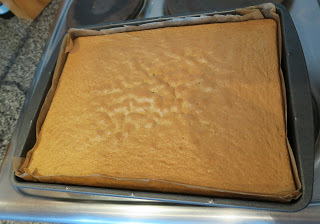 I trimmed the edges of the cake then using a ruler I cut it into 1.5″ squares. 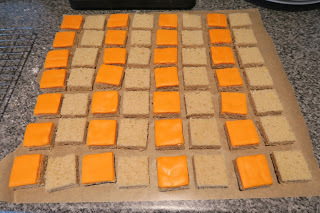 Then I cut each square into half. I spread the apple filling onto the bottom half and sandwiched them all back together. 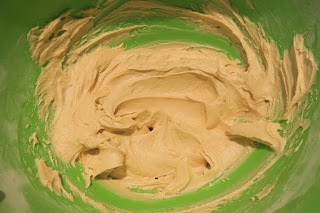 I made a caramel butter cream by mixing butter, golden icing sugar and caramel extract. 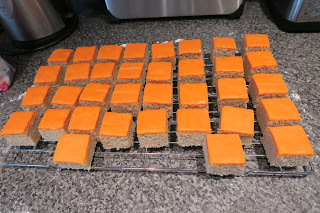 Using a palette knife, I coated the sides of each cake with the buttercream. This was quite fiddly to get 100% neat. I put them in the fridge for an hour for the buttercream to set. 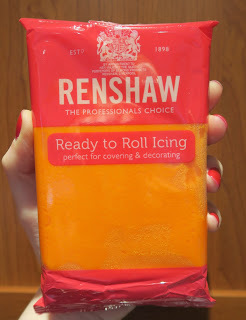 I made a pourable fondant by mixing up 1kg ready to roll fondant with 115ml water and some orange food colouring. To decorate them. I set up a cooling rack with a baking tray underneath and used it to place the cakes on before the pouring the fondant over the top. I melted white chocolate, put it into a piping bag and piped a zig zag pattern on top. Then I added some bronze sprinkles. I didn’t expect the Apple Pie Fondant Fancies to be as neat as professional ones, but I thought they came out alright in the end. The sides could have been neater, but the top were lovely and smooth. My fondant didn’t fully set, even after being in the fridge overnight, so they were quite messy when eating them! And the best bit, the Apple Pie Fondant Fancies tasted just like apple pie! 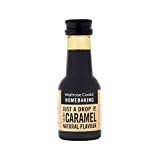 The cinnamon, apple and caramel all came together in a way I wasn’t expecting, and produced a delicious apple pie flavour. This wasn’t my original intention, but it really made the whole experience of making these worthwhile. I’m linking up with the Great Bloggers Bake Off 2016 hosted by Mummy Mishaps, with Bake Off Bake Along hosted by Rhyme & Ribbons and This Particular, and with the Sunday Fitness & Food Link Up hosted by Ilka’s Blog and Marathons & Motivation. 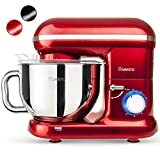 kat – you really are the baking explorer! 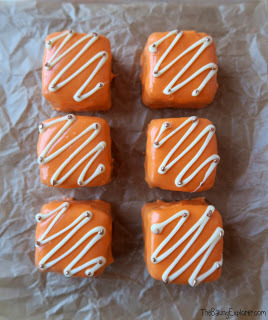 You are always coming up with new recipes that are so fun!These little fondant fancies are a great for tea parties and desserts for the holidays! I'm sure they taste absolutely amazing! Thank you Ilka, that's so sweet of you! 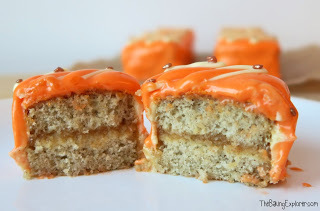 Wow Kat, these look so good and yummy, perfect flavour combo for this time of year. Your decoration is beautifully simple and so very effective. THese are so pretty and I love the flavours, apple pie fondant fancies would sell well in the shops I bet! Great Fondant Fancies Kat. I love the idea of apple pie flavour. Very seasonal and delicious. They look pretty too! Thanks Kate! Yes they are so tricky to make, I think every element had it's difficulties! Thanks Jenny! Somehow my random ideas all came together in harmony! Thanks Angela! I'm sure you could!